Everyone's a Critic. Especially me. Probably no one but that’s okay. I really don’t know how this will go but i guess we’ll find out together. I was wondering if i should put my favourite book or movie first but after days of not being able to decide i just went with the most recent movie i saw, a movie that i found on netflix, and i’m so glad i did. 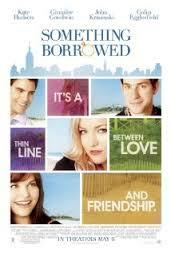 Something Borrowed is one of the best chick flicks i have seen in years, even if after watching it for about 20 minutes you already know what’s going to happen, or do you? I am about to put up a load of spoilers so beware.